There are dogs that love water and bath time and there are dogs that think running water = Armageddon. Thankfully Bear doesn’t mind getting a bath all that much. 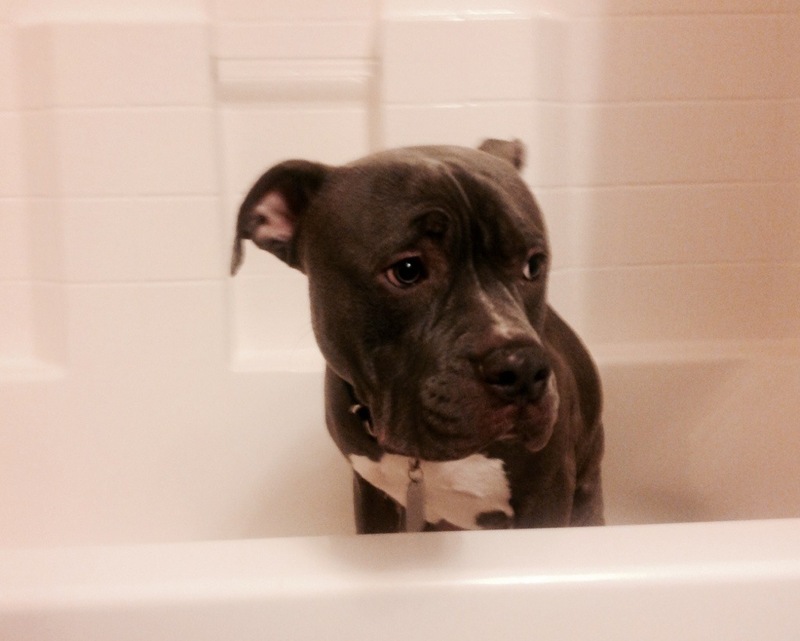 Which is nice, because trying to force 68 lbs of stubborn pit bull into a bath tub is no easy task. Bear is all for pawing at the water as it runs down the drain. I’m not sure if he’s trying to stop it from escaping or he just doesn’t understand were it goes. either way, he keeps himself amused while scrub him down. And I don’t mean I scrub him down with any ol’ shampoo. Oh, no. My dog has to be allergic to almost every shampoo on the market. I found this out the hard way when Bear was about six months old. I took him to the vet because he was scratching himself bald. The Vet was very sweet and understanding when she saw me, all snot nosed and sobbing because I was convinced that my puppy had mange or something worse. Vet: (trying really hard not to laugh) It’s not mange. This is about the time that pit bulls start developing food and skin allergies. They generally have very sensitive skin and are often allergic to the generic soap used in most pet shampoos, so I’m going to switch him to new oil based shampoo. It should clear him up in a few weeks. I was so happy that my dog hadn’t contracted some horrible disease I didn’t realize until I looked at the vet bill later, that the new shampoo cost me a whomping $50.00. Thank you pit bull genes and your soap allergy. Thanks a whole lot. I was able to find a cheeper alternative, John Paul Pet. That’s right folks, The same John Paul that co-founded John Paul Mitchell. You can now get salon quality hair for your pampered pooch. Or in my case, my highly allergic pooch. For half the price the vet was charging me, I get Tea tree (oil based) shampoo that is human tested and dog approved. I also use a conditioning spray in between bath times. This keeps Bear’s skin from drying out and stops all the itching. AND it works better than the stuff the vet was charging me double for. This entry was posted in Bear, Random Crap. Bookmark the permalink.